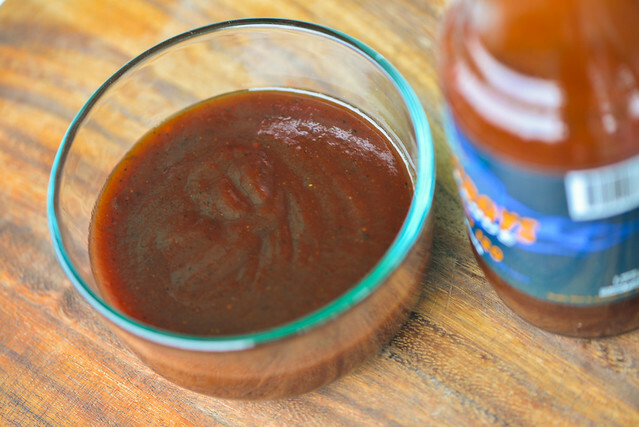 Glossy and sweet, this sauce is built to impress barbecue judges, although that success may not always translate equally as well in the average backyard. Plowboys started up in 2001 as a competition team by Todd Johns and Randy Hinck. The two found success on the circuit, which lead them to begin bottling and distributing their sauces and rub. Plowboys went on to open their first restaurant in Blue Springs, Missouri in the fall of 2013, and added a second location in Kansas City, Missouri a year later. This sauce has a very mild, understated aroma compared to most. Although not strong, it still straddles the standard barbecue lines drawn between tomato, sugar, molasses, and vinegar in a balanced manner. With those usually powerful ingredients not adding up to a strong smell, it makes it even harder to discern the more nuanced elements of the sauce, but with some work, my nose picked up a smokiness and hints of an earthy heat. The maroon sauce has a smooth texture and medium thick, syrupy consistency. It's semi-transparent, making it easy to spot the tons of spices suspended in the sauce, included specs of black and red peppers, along with light dots of what are likely onion and garlic powders. The pour from a spoon starts quick and smooth, then transitions into drips as it begins to slow down. After a couple final drops, a medium coating of sauce is left clinging to the silverware. The sauce has a definite sugary, corn syrup start. Right off the bat, it's almost all sweetness with no depth, but that begins to change as tomato lends a fruitiness, giving the sauce a ketchup-y flavor. A mild molasses flavor mixes in at this point, adding depth to the sweetness. Next the sugary profiles gains some balance from a mellow vinegar tang, and the sauce then takes on a new dimension as the spices start popping out. First you get a garlic and onion flavor, quickly followed by earthy chili powder. A chipotle heat comes next, creating a little tingle on the tongue and adding a faint smokiness. The final taste is a nice balance between sweet, heat, spice, and vinegar. The sauce coated the chicken in an even layer and baked in very well over indirect heat. There was already some blackening going on over the forgiving indirect fire, and then the sauce began to burn quickly when I move the chicken to direct heat. The flavor overall had a bright tomato profile with a mellow tang and spice. Unfortunately though, those burnt spots really tasted burnt and overpowered the mild flavored sauce that otherwise was decent, albeit a little underwhelming. Plowboys Sweet 180 got its name because it got the team a perfect score in chicken during a competition. I can totally understand that, this sauce is designed for barbecue judges—glossy and sweet with just enough spice to give it flavor, but not enough to turn away anyone who can't take the heat. The characteristics that led to success there are ultimately the downfall of the sauce for backyard use. For home barbecue, I like a little more going on in my sauce than Sweet 180 demonstrated, and the heavy amount of corn syrup that bakes down into a glistening glaze over low heat was too sugar heavy to handle everyday grilling, burning quickly and giving the chicken I tested with an unappetizing flavor. 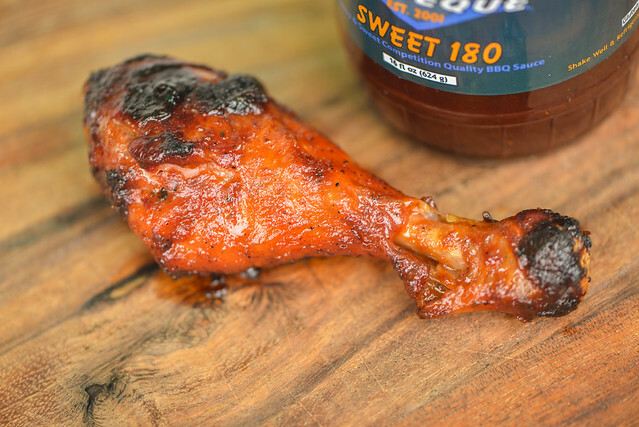 Out of the jar, the sauce is pretty good, and it would serve barbecue—especially ribs and chicken—really well, but for the average griller, it might be a little limiting and a tad too sweet. Thanks for another great review. 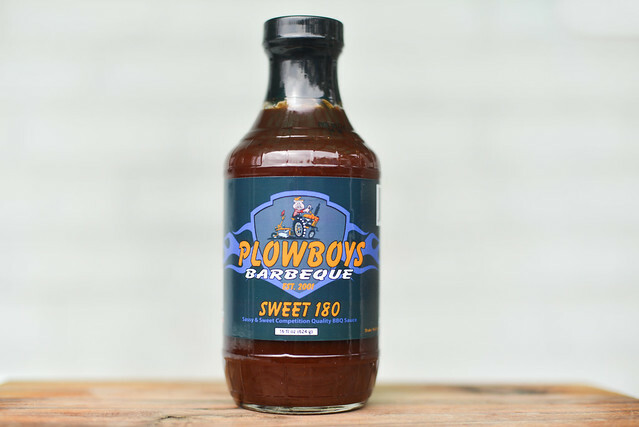 Plowboy's makes some great dry rubs and I was curious what their sauce was like.